Overtones | Afterthoughts of a Composer, Author, Happy Husband and Father. In some way or other, we’re all looking for the answers to the secrets of the universe. It’s the unending quest of the infinitely curious human species. But sometimes in our quest for that destination that is the answer to our question, we lose sight of the fact that it’s our journey for the answer that provides the greatest insights. The quest itself carries more illumination than just the answer we sought. 0105: Why Am I Doing What I’m Doing? It’s a question that can be either toxic or empowering, depending on your attitude. Regardless, it’s a question we all consider. It’s the way to have access to ALL of the downloadable content from ChasHathaway.com. 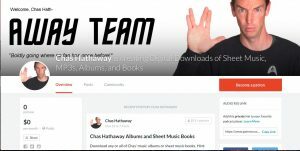 I’ve always kind of liked the idea of Patreon, where people contribute monthly “pledges” to the artists they really like, and as a thank you, the artist sends the patrons cool stuff, inside gigs, and basically gives them a chance to be a little more geek-fan than those who don’t contribute. But I’ve never felt like it was a good idea for me personally. I’m fairly inconsistent in my production–sometimes I’ll go three months without releasing anything, and then I’ll release three sheet music pieces, five MP3s, and a new album in the fourth month. Not much motivation for the contributor for the three months preceding the big month. So I didn’t sign up. 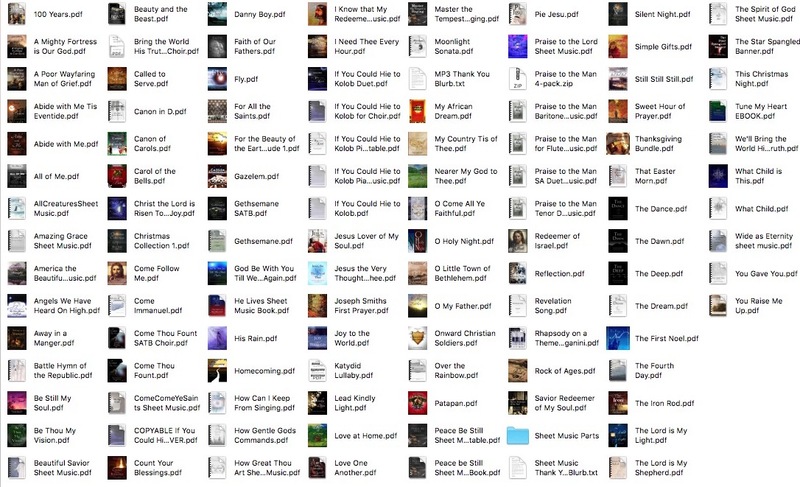 One thing I did have going for me is that I have a lot of products: several sheet music books, a handful of fiction/nonfiction books, dozens of sheet music pieces, and hundreds of MP3s. So one day I thought of an idea (having nothing to do with Patreon) of making a monthly subscription service available that would allow subscribers to have complete access to every digital download. The more I thought about it, the more I liked it. And as I researched how to set it up, I realized Patreon is structured in such a way that it would be extremely simple. So I did it. And I’m calling contributors (or subscribers, if you prefer) members of the Away Team (get it? Chas Hath-away team… clever, eh? Ahem…), and just for fun, I use a photo of me in my Vulcan face. I know, I’m not using Patreon in it’s intended way, but it’s not too far off. 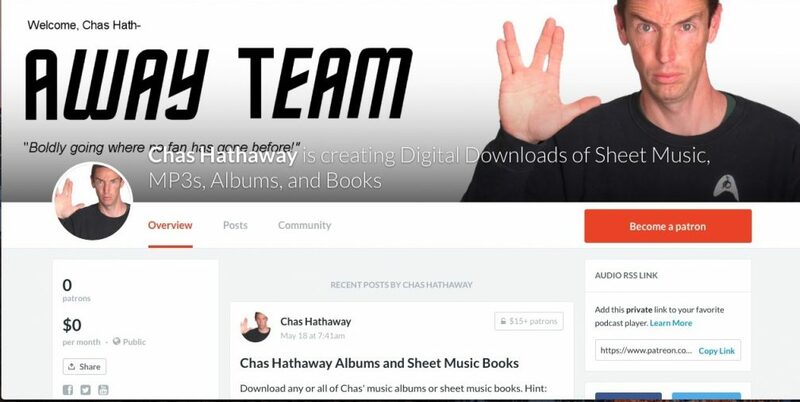 Basically, you contribute $15/month, and as a reward/thanks, you are granted access to ALL digital downloads from ChasHathaway.com–including sheet music, MP3s, books (both fiction and nonfiction), albums, and yes, even the sheet music books, some of which cost more than $15. Once you sign up, you’ll be given access to the Away Team page, which looks like a blog with several blog entries. Each entry has a pile of files (Sheet Music entry, MP3s entry, etc), which can be downloaded by a simple click. If you can’t find something, or there is a product you know exists, but is not listed, PLEASE let me know! I hate to promise people stuff and not deliver! I want it all available to you. Also, please share my Patreon page with your friends, especially those who might like any of the products offered. I had another dream this morning around 8am where I was presented (again, without any real context—the idea just “occurred” to me, if you will) with an idea. In this case, it was the idea that there are two levels of agency. The first level is the basic level that we all have—the capacity to choose our attitudes about our circumstances, and then work within our circumstances to make things work out for the best. This is the level that most people live out their lives in. This is where the real test of mortality takes place, where we show our Father in Heaven that we are willing to do all things whatsoever He commands us. But there is a second level of agency. It is the level where a person rises above his/her circumstances. It’s the level that makes the great leaders, reformers, entrepreneurs, inventors, as well as the tyrants, Hitlers, and manipulative and wildly successful salesmen. This second level of agency isn’t limited to circumstances, but can actually bring about significant changes to circumstances. It’s available to all, though it will manifest itself very differently in every person who chooses to use it. So what is the difference between those who live entirely in first level agency and those who develop and live in second level agency? That’s what we discuss in this program. I had a dream last night where I was given an interesting idea for an experiment. The idea was given without the context of a situation–I didn’t see the experiment taking place, and I don’t even remember being in any particular situation. But I was asleep, and this idea came to me. It was called the poverty experiment. In this episode, I discuss the poverty experiment, and what kinds of outcomes such an experiment might have. What do you think? What would happen if we did such an experiment? In this episode, we discuss a most interesting aspect to the near-death experience: the life review. And lest you think it’s simply your life flashing before your eyes–just listen, you may be surprised.